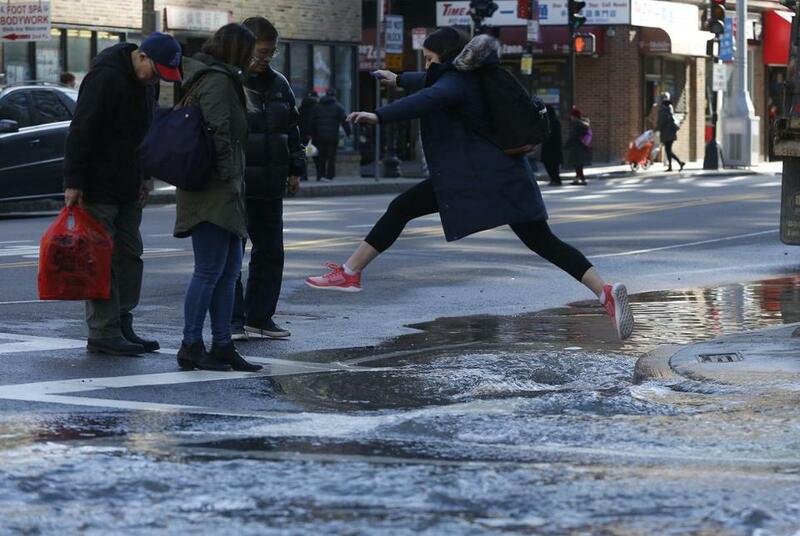 A pedestrian jumped over water on Harrison Avenue at Kneeland Street after a water main break Sunday. “No one is flooded [and] streets are not shut down,” Taylor said. Tufts Medical Center was not accepting ambulance traffic for several hours and the water pressure was affected due to the break, Tufts said in a statement. Water pressure was restored and ambulance traffic was being accepted again by 11:50 a.m., according to Rhonda Mann, a spokeswoman for Tufts Medical Center. Firefighters evacuated offices and classrooms at 35 Kneeland St., a building between Harvard Street and Harrison Avenue on Kneeland Street, after water was found in the basement, Boston Fire Department said in a tweet at 11:36 a.m.
Eversource Energy and National Grid were on scene and police officers were assisting with traffic as of 11 a.m., according to Boston Police Officer James Moccia. Boston Water and Sewer inspectors were expected to be on the scene throughout the day to investigate.